NAFTAN (B)- One of the best wall dives in the CNMI, with amazing visibility and fish live, located on the southern tip of the island. The top of the wall starts at 45 feet and goes down to over 130 feet. 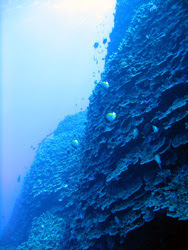 On the top portion, there are some great coral formations that are home to huge clams among other things. 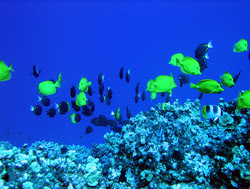 As one starts to descend on the wall, you will find magnificent fan coral and colorful animal life. 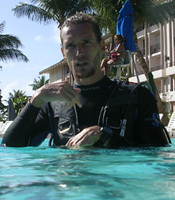 Since this dive is at the edge of the abyss there is always the possibility of running into the larger fish like Napoleon Wrasses, Groupers, and Sharks. Current: None to Strong. BEWARE: The currents can be strong on this part of the island and pick up in no time. Be sure to plan your dive accordingly.